Right-wing activists released a video today dishonestly claiming that Planned Parenthood is "selling body parts" of aborted fetuses in violation of federal law. You can watch the dishonest video here and the full footage here. 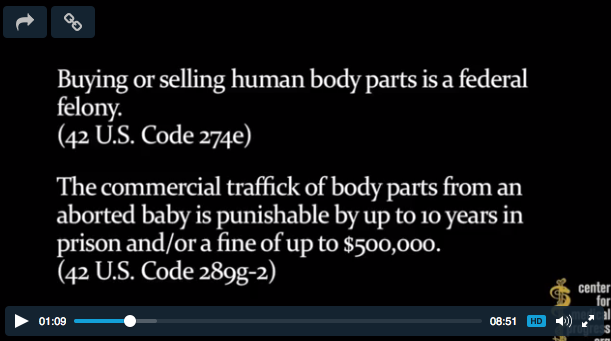 In the deliberately deceptive video, the video editors repeatedly refer to laws banning the sale of organs from aborted fetuses and refer to one of the undercover people as the "buyer," suggesting that they were planning a transaction with Planned Parenthood and started a twitter hashtag #ppsellsbabyparts. However, in the full video, the faux "buyer" actually says, regarding the purpose of the meeting, (2:27) "I wanna pick your brain..." which suggests an informal conversation rather than any plans for a transaction. 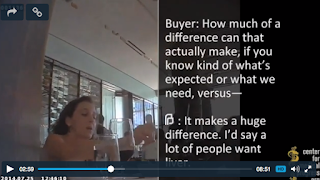 And at (4:22) the "buyer" says "I'd really like to connect with people who...they don't know that we're out there" which again clearly suggests that they are not asking Planned Parenthood to sell body parts. 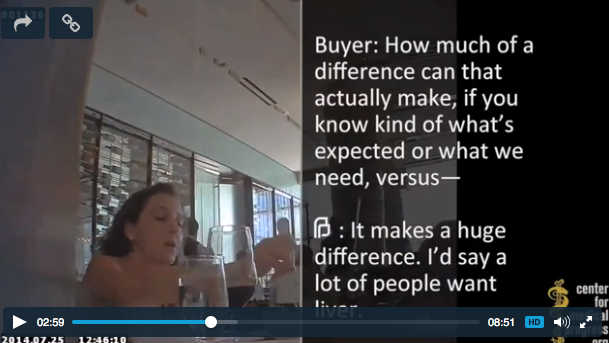 At no point in the video does the Planned Parenthood employee suggest that they are open to selling body parts. Every provider has had patients who want to donate their tissue, and they absolutely want to accommodate them...they just want to do it in a way that is not perceived as 'this clinic is selling tissue. this clinic is making money off of this.' I know in the Planned Parenthood World, for example, they're very very sensitive to that and for an affiliate that's going to do that, they need to...some might do it for free...[but] they want to come to a number where it doesn't look like they're making money. They want to come to a number that looks like it is a reasonable effort for the effort that is allotted on their part. 2:22:26: "At the end of the day, if you're going to take money out of the equation, which is what most affiliates are trying to do, how can we do this for you in the most beneficial way"
2:24:52 "Anything you can do to explain who's benefitting, the benevolence of what they're doing, I think that holds as much value as any cash prize." 2:26:00 "Perhaps the difference is affiliates are looking to benefit in very different ways than just dollars and cents. Again, they're not going to do it in a way that costs them money. They want to break even. They want to be compensated for time and space and whatever impact that it has." In fact, just to underlie how willfully dishonest the "Center for Medical Progress" is being, both of the "buyers" acknowledge in the video that Planned Parenthood is not selling tissue. Buyer #1 (1:29:05): "I never see that. I don't look at it that way. We're not selling tissue." Buyer #2 (1:29:29): "The researchers are paying for procurement...they're not buying a brain." Except that, as Planned Parenthood told The Hill, its affiliates “can legally receive reimbursement from a tissue donation procedure for the ‘additional expenses related tissue donation, which can vary based on individual circumstance,’ but it does not go to staff members or providers.” These “additional expenses” might be the $10-30 it costs to transport the tissue being donated, which Planned Parenthood notes is “standard across the medical field.” And no, the patient donating the tissue doesn’t receive any financial reimbursement either. The "Center for Medical Progress," the group behind this video, was clearly being intentionally dishonest in implying that Planned Parenthood was "selling body parts" in violation of federal law. Planned Parenthood should sue them for everything they're worth, and should find out through the process of discovery who else was involved in this dishonest campaign. If our legal system is even remotely adequate, this type of nonsense should be punishable to an extent that makes it clear that these dishonest tactics are not worth it. 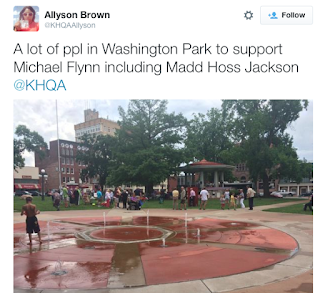 What's more, the right-wing blogosphere went all in for Flynn. Breitbart.com, of course, wrote numerous articles attacking his primary opponent LaHood (often, unsurprisingly, without noting the conflict of interest), but that was just the tip of the iceberg. Many (most?) rightwing bloggers billed this as an epic battle between the "grassroots" and the establishment. And guess what? The establishment, aka LaHood, won the primary by over 40% of the vote. It was an absolute landslide. It was almost as if conservative bloggers were trying to prove that they are completely beholden to the whims of the establishment GOP. When they're not being actively propped up by Americans for Prosperity, or Fox News, or the health insurance or coal industries, they really have no ability to make much of a difference in elections, even in deep red districts like Illinois 18.